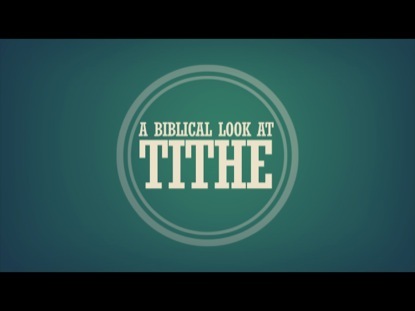 Is it actually important for Christians to tithe? The first job I ever had was at Sonic, and I was 15 years old. I worked in the kitchen, cooking food for all the customers. The worst part about this job was when we closed, we had to pull out the grill and clean behind it. We also had to clean the vent filters above the grill and it was nasty. At the beginning of the day, the filters on the vent are a very nice chrome color. At the end of the day they were just black because of all the smoke that rose from those wonderful, one hundred percent beef, fresh hamburgers that we spent all day cooking. I remember getting my first paycheck and I was excited because I was going to have some money. Now, on a paycheck stub, there are two very important numbers. First, the amount of your check before taxes are taken out. Second, the amount of your check after taxes are taken out I saw that my paycheck was written for less money than I actually earned. 15 Year old me was upset because somebody had stolen 30% of his money. Just like we pay taxes to our government, the Israelites were commanded to pay taxes. This tax was called a tithe and it was a little different because it was given to God as an act of worship for what He had done for Israel. The question I have to ask is this: How important is tithing for God’s people? Are we required to put money in the offering plate, or is it just something good to do? Remember when we read a law in Scripture, we have to ask two questions. The first is: Was this law written to a specific people living in a specific context during a specific time period, or is it explicitly for all people at all times? There were some laws that were given to Israel at this time that are not given to us in the same way. We have to ask, was this law written for me today? The second is: How does this law apply to me? We can learn something about God by reading His laws. We can also learn something about what God desires from us. Here’s what I notice about God in this law. God gives us the things that we have. 15 Year old me didn’t think about it, but his first job (at Sonic) was a gift from God. Our families are gifts from God. The stuff that we have is a gift from God. If God truly is God, then everything belongs to Him. If everything belongs to Him then it must be a gift from Him if we have it. Life itself is a gift from God. God also wants the credit for the things He has given us. When we do have jobs, the tendency we have is to say something like, “I earned this money, I can use it the way I want.” The truth is, that money is a gift from God and God desires to be acknowledged for that gift. If you get an allowance or get paid to do chores, it is a gift from your parents or parent figures. But it is moreso a gift from God. Our paychecks, cattle, stuff, crop, etc… are all first and foremost gifts from God. In our lives it is difficult for us to say that we earned anything because all things are gifts from God. The fact that God gives anything to us means that He doesn’t desire that stuff. He desires praise. He doesn’t need our praise, but He does desire it because He desires us. This law that God gave specifically to Israel as the lived in what would be the newly acquired land of Canaan, means something very specific for us today. First, we live our lives in such a way that we acknowledge God for what He has given us. For the Israelites, it was giving a portion of what God had given them back to God. For us, it is exactly the same. Remember that Abel’s offering to God was accepted because it was the best of what He had. Here, the Israelites were to offer a portion of the land’s produce as worship to God for His gifts. 2 Corinthians 9:6-7 states clearly, “Remember this: The person who sows sparingly will also reap sparingly, and the person who sows generously will also reap generously. Each person should do as he has decided in his heart — not reluctantly or out of necessity, for God loves a cheerful giver.” One of the greatest ways that we can worship God is by giving back a portion of what He has given us. In doing this, we actually rejoice for everything good that God has given to us. What it means for us today is that if we acknowledge God for what He gives us. If we give back, God promises to lift us up, to elevate His people: probably in ways that we can never imagine. Remember that God’s people are actually commanded not to give out of necessity, but cheerfully. We are also told to give as we have decided in our hearts to give. Those who do not give, let’s begin worshipping God this way, by acknowledging that He gives all things. Feel like life is just one big war? Are you in a position of authority?